Any type of rot is a cause for major concern, particularly if it’s in the underlying deck boards or support system for your vinyl deck. Rot causes softness, weakness, and could potentially be a safety risk if it isn’t attended to immediately. Look for soft spots or discoloration as a warning sign, and then get help. All types of wood have a tendency to crack; this is normal. However, significant cracking or larger cracks breaking away from the structure should be a concern, as this is a sign that there could be a loss of structural integrity. Cracking can occur for many reasons – such as too much pressure or stress on the structure. There are many reasons why cracking can occur, but in the short run, it all means you need a professional’s advice to prevent it from causing structural damage or failure. Uneven decking may not seem like such a big deal compared to the other items on this list, but an uneven vinyl deck surface can pose a tripping hazard and result in pressure and stress placed on certain parts of the deck. If your decking is uneven, you can repair it by replacing the uneven boards (but you might need to recover your deck as well). There may be other solutions that require a less invasive method – check with your neighborhood deck vendor about your options for repairs. Foundation issues can quickly become serious, as they generally progress once they start – as the ground beneath the foundation shifts. A crack in the foundation can also be the result of uneven pressure on the house or deck. Any kind of foundation issue needs immediate attention. It takes a lot of pieces to hold a deck together, so it’s not surprising that a few things can start to shake loose in older decks, particularly if it’s an older deck the uses less secure attachments like straight nails. When things start to wobble, it’s time to get it tightened or perhaps change out the fasteners for something that will hold a bit better. 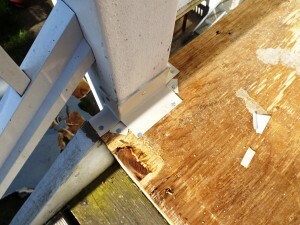 Wobble isn’t a sign that your deck needs to be replaced, but it is most definitely a sign that it should be looked at. It’s easy to overlook the need for a secure ledger flashing to keep out water – but it’s a common problem that can lead to major issues. If water can continue to get in between the house and the deck, then it can get into the deck ledger and the structure, which can eventually lead to rot. Replacing deck flashing with new PVC deck flashing isn’t that difficult – but if you’re new to the whole home improvement game it might be a good idea to have a professional take a look. They might also be able to spot other problems that you might have overlooked and can recommend an easy fix. Installing a PVC vinyl membrane over your deck now is an excellent plan, as it will keep the underlying structure is as good as shape as possible while making the deck surface look brand new.